Whenever my youngest cousin comes down to Edisto, she always wants to find shells, but is adamant that the shells we find come without eyes. This is because one year when she was even younger we found a really pretty shell, picked it up, and out popped a hermit crab. She screamed, ran back to the house, and I laughed at her not knowing that she would develop a lifelong phobia relating to shells with eyes (aka hermit crabs). 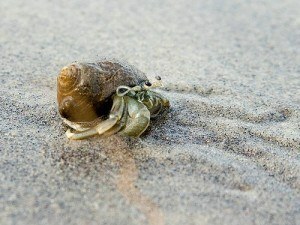 Of all the crabs on the beach, hermit crabs are the luckiest of the crustaceans. Theyre kind of like RV-enthusiasts who bring their homes with them wherever they go, only in this scenario the homes were talking about are random shells washed up on the beach and not $100,000 mini-mansions on wheels. The reason hermit crabs live in shells is because unlike other crabs that come equipped with their very own hard shells, hermit crabs have soft bodies and they have to take up residency in shells to ward off predators. Generally, the crabs find old snail shells or any other type of shell that has a cavernous interior so that they can pull their bodies inside while keeping their legs and heads  and eyes  outside of the shell. They tuck their legs and heads in when not crawling around, but if their shell gets picked up, more often than not the hermit will thrust its head and legs out just to let whoever it is holding the shell that its occupied. Throughout the life of a hermit crab, they can have many different sized shell-homes as they grow. Sometimes they even forego shells and move inside other hard items found on the beach including soft drink cans, although on clean beaches like Edisto thats a rarity. In the summer months, many visitors to Edisto end up going home with a hermit crab as a pet. Some are sold in various gift shops here on the island, others are found in the sand. The good thing for all the parents out there who just cant say no to their kids is that hermit crabs are very low maintenance pets. All they need is an old fish tank with a gravel bottom, various shells of different sizes so that when the hermit crab gets bigger it can take up residency in a new shell, and food and water dishes. Keep a spray bottle of water handy because they need to be sprayed once a day to keep from drying out (and so they can remember the feeling of the oceans mist). Keep the cage at about room temperature or warmer and then enjoy the crabs. They can pinch, but if they are regularly held and played with they become used to human interaction and most likely will not pinch any fingers. Its a good idea to handle the crabs often because despite their name, they are actually very social creatures and like to have contact with people and other hermit crabs. This interaction is important for the longevity of the hermit crab. At one point during my years on Edisto, another cousin and I decided to adopt a hermit crab and we ended up with six of them. We named them Frank, Furter, Reba, Scott, Enrique, and Fancy. They all loved climbing around together and racing on the carpet. But then Furter died and Frank followed suit. Then the cat got a hold of Scott and we were left with just Reba, Enrique, and Fancy. Once their little crab condo was down to half of its original occupancy, all of the crabs just got kind of lethargic. We adopted them all in July and by September they were dead. According to many hermit crab enthusiasts, properly cared for crabs can live to be 75 years old whereas the typical hermit crab taken home by vacationers lives for a couple of weeks or months. The average lifespan for hermit crabs in the wild is 25 years. One of the most interesting facts about hermit crabs is that they really do enjoy the company of others and should almost always have a friend whether theyre in the wild or kept as a pet. It is said that hermit crabs are one of the few species that find soul mates and once that mate is found they prefer to be together forever  and what better place to live out ones life with a soul mate in tow than Edisto Beach?